As I have been knitting mainly from stash lately, its contents influence what I decide to knit. Sometimes I come across a pattern I want to knit, but am not sure whether the stash will support it. If I clearly do not have the yarn, I evaluate whether I want to purchase yarn and knit it now, or if I will just wait for later. That is actually the easier situation. The stash is lovely and I enjoy knitting from it. I do not feel deprived when I decide to wait to buy yarn to knit something. It also makes it all the more enjoyable when I do buy yarn. I am not against buying more yarn, but right now, reducing the stash is the right decision for me. Why, yes, I do realize that all this going on and on about knitting from the stash means I am pushing myself closer and closer to a not insignificant yarn purchase, but I digress. The anxiety enters when I think I might have the yarn to knit something, but the yarn situation could be tight. Having been burned by recent yarndage issues, I have become even more nervous. While I so dislike the idea of running out of yarn, I receive quite a thrill when it is close, but works. With this in mind, I began the swatching. I got gauge. I checked the pattern and checked the stash. The yardage matched, but I was not yet convinced. I know how those numbers can have quite the plus/minus range. 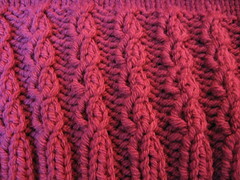 Still, the pattern looks like such a nice, pleasant knit, that forging forward is the right choice. If I do not have enough yarn to finish it and cannot get more of it, this is not a tragedy. I think I would enjoy knitting it again when I do have the necessary yarn. That being said, I am getting ahead of myself. This yarn could be enough and work out just fine. In fact, it looks like it will. I have already finished the back and am about one-third of the way up the front left of my Golden Vintage Cardigan. Where did this week go? Perhaps part of it was eaten by those new allergy meds I recently started taking. I do know what stole some of it, and it is not worth mentioning. Still, I have kept busy amongst it all. The current pair of socks is so close to finishing, and I do not want it to end. I have enjoyed the knitting, and they have been perfect companions for the stop-and-go pace of this week. While I am looking forward to starting the next pair, and hope it is as compatible as this pair has been. While I have not spun as much as I like, I have been in a fiber-y mode. I played with some leftover fluffy bits and some angelina. As soon as I had spun up the singles, I Navajo-plied them to end up with this itty-bitty skein. 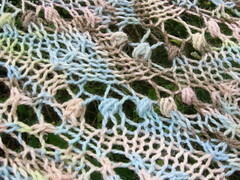 I can see making some yarn with a wee bit of the shiny, and then turning that yarn into a lovely lace piece. However, that is not likely to be my next spinning adventure. 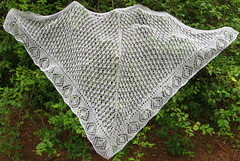 I finished this lace at the beginning of the month, but just now got around to the blocking. This is Ene's Scarf from Scarf Style. I knit it with Misti Alpaca Lace. This is a graduation present for a great-niece. It is larger than I had expected. In fact, I do believe that at nearly six feet across and nearly four feet deep, it moves from scarf to shawl classification. I like the pattern, enjoyed knitting it, and might knit it again one day. Next time, I will cast on with larger needles, as this area was a bit tighter than I would prefer. We still have not made decisions about our weekend plans. Since we grilled on Thursday, it felt as if the weekend has already begun. Personally, I am hoping for quiet relaxation, and the kind of weather the garden needs. Whatever happens, I will bring knitting. 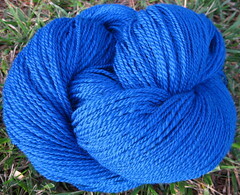 I spun and finished four ounces of some combed top from Little Barn in Brite Blue this week. I had thought about getting out there this weekend, but that did not happen. It will probably be next month before I have a chance to make my way out there. I like the little Saturday fiber group they have, but just do not make it very regularly. It is even less frequent that I bring my wheel. I think I may prefer spinning alone at home, but I do admit I have not given public/social spinning much of a chance. Anyway, this is a two-ply somewhere in the neighborhood of 370 yards. I have not made plans for it, but it has sat next to my Walker Treasury for inspiration. It is still a bit damp, so I am not completely sure about the finished yarn, but I think I might like it. I definitely enjoy gazing at the color. Its brightness (though not quite as bright as this picture) is quite a change from the current socks. The knitting of the psc socks on the needles (we will not mention to which month they belong) is quite nice. They are modified Red Brick Road socks from the Fall/Winter 2008 knit.1 magazine. 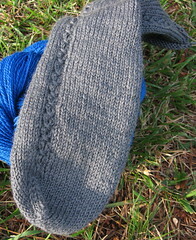 They do not look very good on the needles, but on the feet, the little mock cables show up quite nicely. This pair is for Brucie. He does not mind that the color is a bit on the plain side. I think I have a more colorful pair for him waiting to be knit in one of those psc bags. A partial sock and a new skein of handspun is not much to show for the week. However, I have been sifting through the stash and swatching. I may have something meaningful to show for my efforts soon. Perhaps meaningful is a stronger word than I should use, but I am trying to be optimistic. I am also excited about the potential new project. No, I am not posting a video of me taking my vitamins, eating my veggies, flossing, brushing, and making my bed. Instead, I offer a nupp-flash. 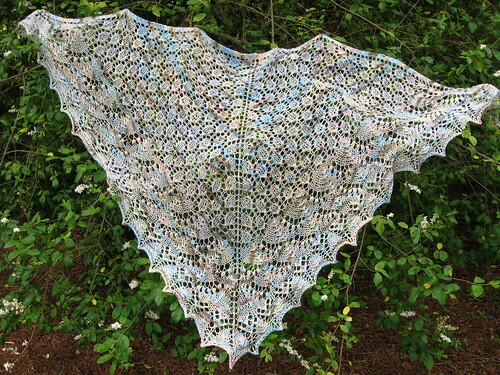 I finished the Swallowtail Shawl just in time for Mother's Day. I added a couple of extra stitches to the garter-edge, and I think that looks nice. I also added some glass pearl beads to the last charted row. Other than that, I knit it as written. As it really was down to the wire on finishing, I did not take measurements, but I believe it was close to six feet across and nearly four feet deep. I used nearly every bit of three skeins of Knit Picks Imagination in the Pixie Dust colorway. I hope Mom likes it. It was hard to tell, as Sunday had many bumps. It had its good moments too. I received a very sweet card and flowers from the kids. My niece doubted my credentials to receive a Mother's Day gift. She thought that she had settled the matter when she told me that Taki is not a girl. It would seem she is a bit confused about the day. I wish I had captured video of her singing and dancing, "Boogie-Woogie-Piggy," but I saw her performance after she had been playing outside in her ballet outfit. Did I mention it has rained every day this month? Yeah. She was a vision of the boogie-woogie, as well as the piggy. 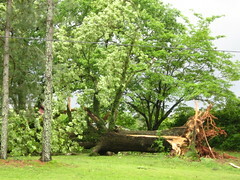 There was a tornado on our street yesterday. If it had turned a few hundred yards further, it would have gotten us. That is about more than I can wrap my mind around. I feel grateful to have been spared, but feel for the people whose property was damaged. I decided to try to move forward by working out my tensions on some bread dough. I mostly followed this recipe, and gave the second loaf away. I like it pretty well, and look forward to the next loaves I bake. I would give you a picture, but the pretty loaf is the one I gave away, and the less pretty one has been subjected to my very un-pretty slicing. I think my next loaf will come from a booklet I recently received. They are all no-knead bread recipes, and I have wanted to try out this method for a while now. Paw is out-of-town, so we have been over visiting Mom a bit more. This is usually fine, but I am on the deadline to finish her shawl for Sunday. I guess it is good that she requested a simple dessert for the day. Mmmm...dessert. I am hungry. I had better make a peanut butter and jelly sandwich and get knitting. Oh, but the spinning wheel is crying only slightly less loudly than the fiber stash, which is absolutely wailing for attention. Yes, the piggy scarefest (h1n1) is officially here. They closed many schools for Thursday and Friday last week. Wednesday night my sister told her son that if he was very good and went to bed without another word he could stay home the next day, and if he kept to excellent behavior he would not have to go to school Friday, either. On our way home from picking him up Thursday, a big board from an even bigger truck bit our car. Bruce's excellent driving saved us from the worst of it, but the incident ate the following 36 hours. After being on the verge of a breakdown Wednesday evening, that nearly put us over the edge. Maybe it meant that I cracked up a bit more than I am willing to admit, but I finally settled on laughing as the appropriate response to all of this. The new mirror should be here soon. I think I solved the dilemma of who should receive Ene's Scarf. A great niece graduates from high school later this month, and I believe this will be right for her. I finished grafting it Sunday night (maybe it had become Monday at that point), and now it just needs the weaving in of ends and blocking. With one lace off the needles, I cast on for new as soon as possible. It is a Mother's Day Swallowtail. I have a good start on it, but it could be that it will be a Graduation Swallowtail, and Ene will be Mom's. Monday was a wonderful night with my Skanky Knitter friends. For too long, we have been missing each other, and we finally caught up last night. We stayed until they closed the store (10 p.m.), and talked a little longer out in the parking lot. We finally dispersed after random dude pulled his car up next to us and inquired as to whether we were experiencing any flu symptoms.